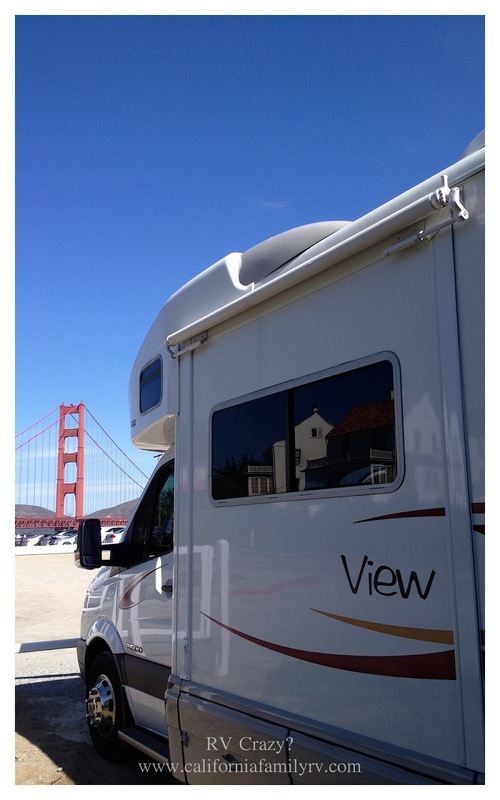 Here she is, our 2008 Winnebago View J, or as we fondly call her, "Winnie." 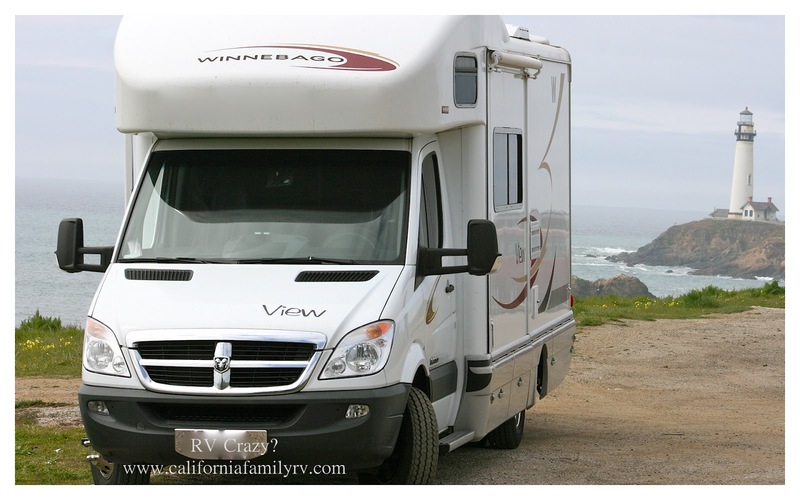 We love to explore in our little rv, and get out as often as we can. We decided to purchase this model for several reasons. First, its diesel engine is dependable and long-lasting (knock wood). Made by Mercedes, these little guys have a great reputation for quality. So we were able to purchase an older model and not worry so much about it falling apart on us. Also, the View consistently gets between 15-17 mpg, making it a very fuel-efficient vehicle. It gets better gas mileage than many passenger vehicles on the road! Possibly most important to our family, the Winnie is slim and trim (relatively) making it easy for almost any driver. 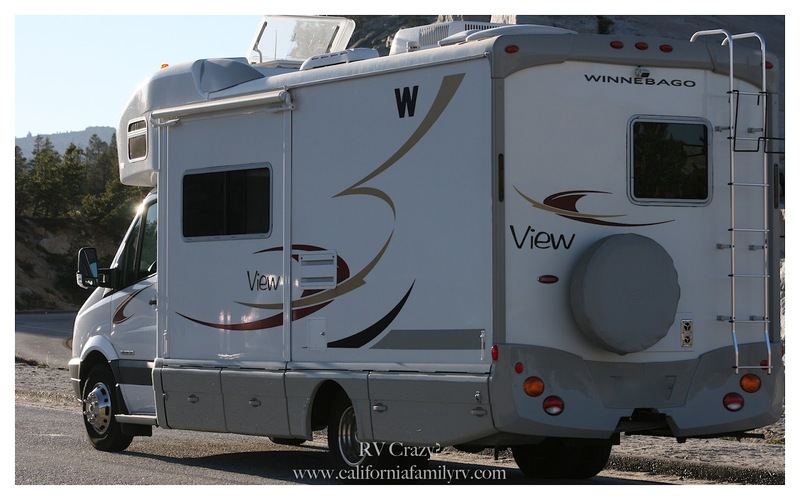 We wanted to get an r.v. that both my husband (who can drive anything) and I would feel comfortable driving. I have even taken her out on a solo trip, and have no qualms about doing so! It's actually really fun to drive. It's also very easy to park and because it is so little (again relatively) it can almost fit into a standard parking space, so parking and camping spots are simple to find. For those of you curious, here is what some of the interior looks like. The fabric is a little 70's chic, but since we have three (messy, VERY messy) kids, it's almost always covered in protective fabric (read: dropcloths for children) anyway. 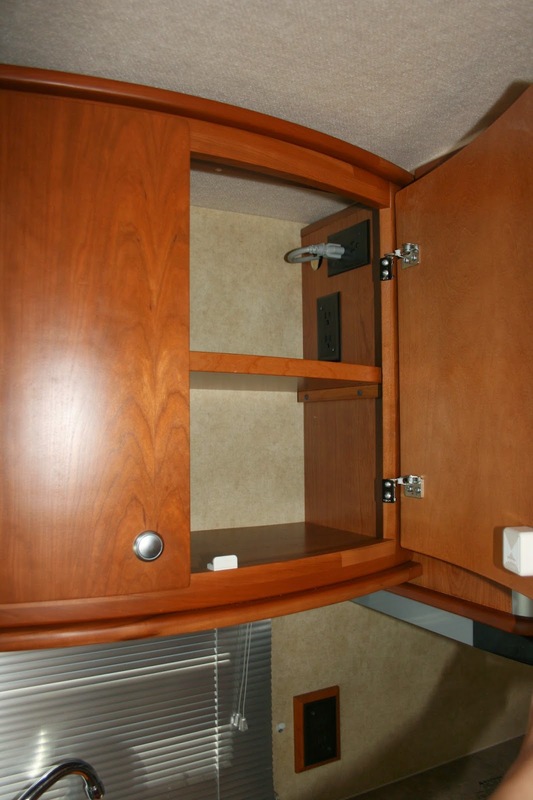 Here's the dinette. We were enjoying Thanksgiving dinner in Sedona, Arizona here. As you can see, it comfortably seats four, so we purchased this little stool which is comfy enough for us, and super-easy and light for storage during our drives. Our fridge and freezer have been perfect so far. I can always (barely) squeeze in just enough food for our trips. Our longest time out has been for 10 days so far and we made it perfectly. Any longer than about a week, we need to shop and replenish our fresh supplies. Little vanity sink outside bathroom. Our master bed. Very cozy and comfortable. 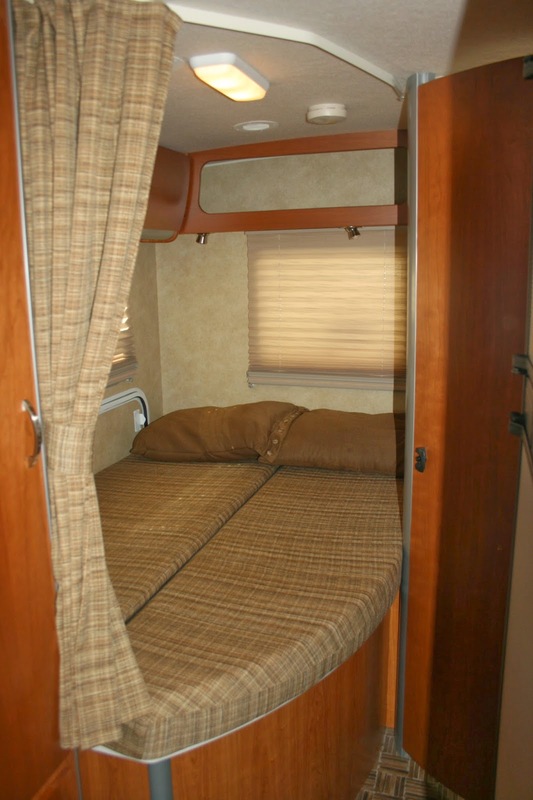 We sleep better in the r.v. than at home. Maybe it's the vacation, but I'm seriously thinking about getting a bed like this for our house. hehe. We've topped it with a memory foam piece purchased on amazon and cut to size. Then use regular sheets and blankets. Perfect! 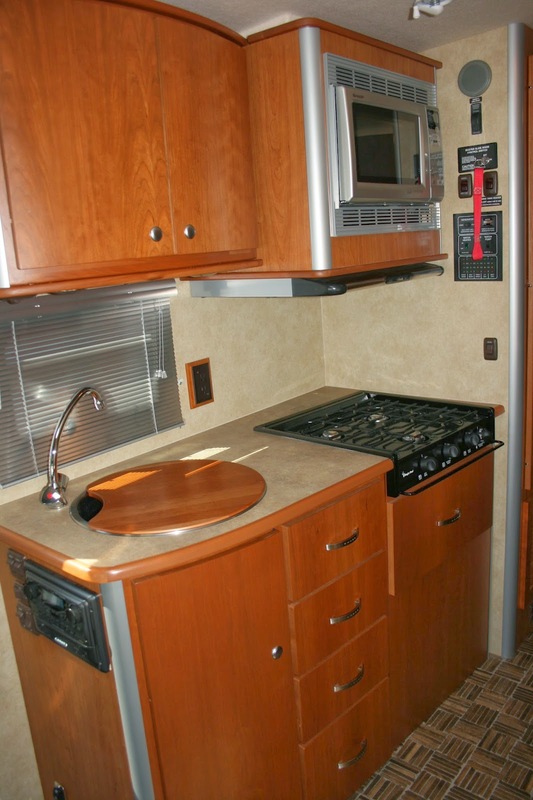 Our kitchen includes a stove-top, and microwave/convection oven combo unit. It also has a great large sink. Just some of the plentiful storage in the View. 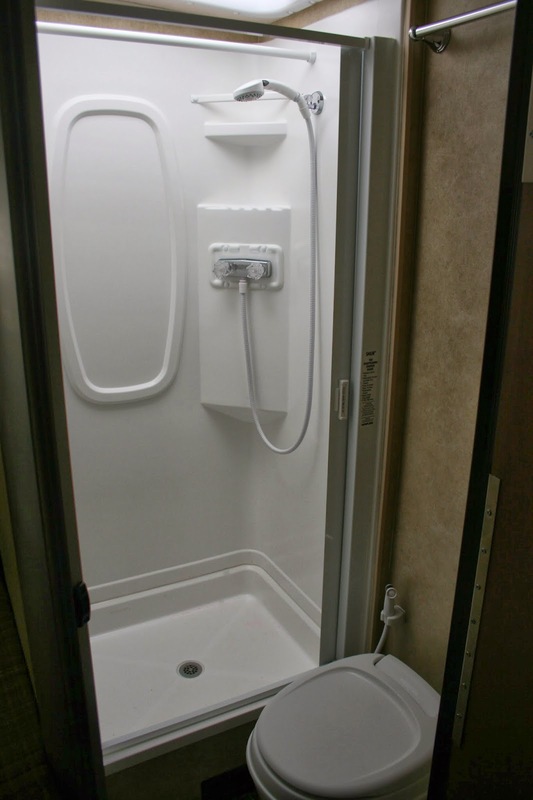 There is so much well-thought out storage that we always have extra space left after packing. And with five campers, I think that says so much about the Winnie's design. We love it! The kids love the bunk above the cab. The girls sleep up here normally, but all three of our kids have fit there and slept well on occasion. There is also a TV/DVD player but we need to do some upgrades as the player stopped working right after we got it! Anyway, it's a great feature for the drives, as we can use it to play our own movies on it through our own devices. So, that's our tour of the Winnie. Hope you've enjoyed it. We sure love our mini-home away from home, and are very thankful for it!